It’s only Monday and there’s a top-10 matchup tonight with ACC regular season title and NCAA Tournament No. 1 seed implications. Doesn’t get any better than that in February. Here’s a breakdown of tonight’s biggest games and how the results could affect the NCAA Tournament resumes of the teams involved. 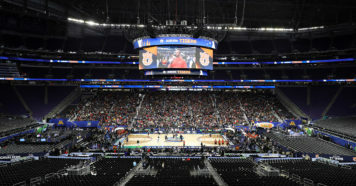 The projected NCAA Tournament seeds listed below come from Saturday’s Bracket Preview show if a team was featured in the top-16 reveal and if not, its seed comes from Stadium’s latest NCAA Tournament projections, which were published earlier today. Virginia has as tough of a three-day stretch as you’ll find in college basketball since the start of conference play. The Cavaliers hosted No. 2 Duke Saturday and they were on the wrong end of the Blue Devils’ 13-of-21 three-point shooting explosion in an 81-71 loss. Now they travel to North Carolina to play the ACC’s other first-place team. The Cavaliers have won three in a row against the Tar Heels, but they lost 65-41 in their last trip to Chapel Hill in 2017. There’s an old adage in boxing that “styles make fights” and Virginia and North Carolina should provide a great contrast in style of play. The Cavaliers are 353rd – that’s dead last nationally – in tempo while the Tar Heels are fifth. Virginia would be comfortable scoring in the low 60s. North Carolina scored 113 and 88 points in a pair of home wins last week. 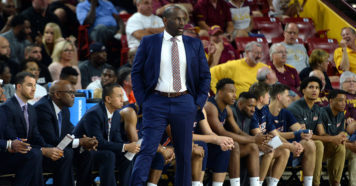 This game will have a real impact on the ACC regular season title and it could affect which ACC schools – and how many – are in contention for a No. 1 seed in March. Duke and Virginia earned No. 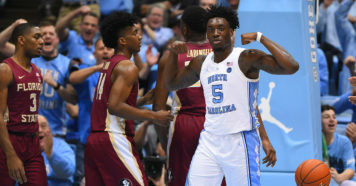 1 seeds in the NCAA Men’s Basketball Selection Committee’s top 16 reveal Saturday and North Carolina was the No. 7 overall team. Both schools have five more Quadrant 1 games in the regular season, including Monday’s game. However, North Carolina will play three of those games at home and Virginia will play just one in Charlottesville. Both teams could really use a win but for different reasons. Kansas was a No. 3 seed in Saturday’s Bracket Preview Show, so in the big picture the Jayhawks have a strong tournament resume, but they’ve lost four straight away from home and they’re 1-6 on the road this season. If they want to keep “The Streak” alive, they probably need to win at least three road games in conference play this season. They still have four road games left – TCU, Texas Tech, Oklahoma State and Oklahoma. Plus, winning on the road would help Kansas preserve a top-four seed, if not improve to a No. 2 seed. The Jayhawks have eight Quadrant 1 wins, which is the second-most nationally behind Michigan State, but at their current trajectory, they might finish with a record in Quadrant 1 that’s just slightly above .500. As for TCU, all of their losses this season are “good losses,” if such a thing exists. But TCU’s lone Quadrant 1 win is greatly outnumbered by those losses. The Horned Frogs have five remaining games in that quadrant, including four at home, so their schedule sets up nicely to improve their resume over the course of the next month. Given how Kansas has fared on the road in the last two months, it might be fair to ask what’s wrong with TCU if it’s unable to beat the Jayhawks at home, which Iowa State, West Virginia, Texas and Kansas State have already done. An 0-2 week for Baylor last week leaves the Bears two games out of first place in the Big 12, while Oklahoma is only a half-game ahead of ninth-place Oklahoma State following a four-game skid. Baylor is projected to finish the regular season with 19 wins, one more than Oklahoma, according to kenpom.com, which could put both schools squarely on the bubble. If last year is any indicator, it’s possible to get an at-large bid to the NCAA Tournament after going 8-10 in the Big 12, so eight wins in conference play should be the baseline target for the Sooners and Bears. Baylor won 77-47 at Oklahoma just two weeks ago to the day and another loss for the Sooners would drop them to 15-10 overall and 3-9 in the Big 12, which would put their at-large hopes in dangerous territory. Let’s show the Patriot League some love. It’s probably a pretty safe assumption that one of these two teams will win the Patriot League’s auto-bid in March. Bucknell is currently in first place with a 10-2 conference record, one game ahead of Lehigh. The Mountain Hawks have a two-game lead over third-place Colgate and American with just six games to play. On Monday morning, Bucknell is ranked No. 145 on kenpom.com and Lehigh is No. 153. For reference, that’s comparable to a team that would finish in the top half of the Mountain West or a low-end Pac-12 team. MORE: NCAA Tournament Bracket Scouting – Who’s a Lock and Who Has Work To Do?